In a large pot on a medium to high heat, add the oil and onions, cook stirring every now and then for about 5 minutes or until the onions begin to brown on the edges. Toss in the Oxtail, a few at a time and brown them all over. Repeat until all the Oxtail pieces are browned. Add in the salt, pepper and paprika and any remaining oxtail, stir, now add the coke and wine and simmer for 5 minutes. Now you are ready for the slow cooker. Toss all from the pot into the slow cooker, crumble up the beef stock, add the soup powder, and 1/2 water, put the lid on and cook on low for 10 to 12 hours. After about 4 or 5 hours check to see the liquid level and add water if necessary. Once cooked, switch off your slow cooker until about 2 to 3 hours before your meal. Give the mixture a gentle stir and reheat on low with the lid off. Thats it, the very best Oxtail stew I have ever eaten. Serve it with mashed potatoes or pap. For an Oven version of Oxtail stew, try the Oxtail stew for Wintery days recipe. We’ve made this a ton of times and it’s always great, tomorrow I want to try jazz it up by adding some stamp and beans in the slow cooker with it as there is always so much sauce, I’ve done it before with lamb stew. Do you think I should soak the s&b’s first?? And thank you for sharing this amazing recipe!! Good luck trying to sell this recipe to an Italian! Yikes, Coke in a recipe!!!! 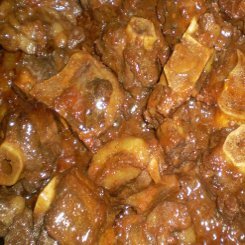 Thanks for such an easy recipe for my oxtail stew. Thank you. Really do appreciate. Keep up the fabulous work!